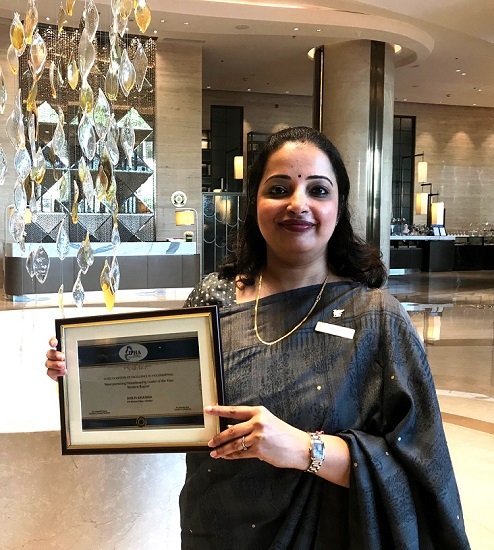 Shilpi Khanna, Assistant Director of Rooms, JW Marriott Mumbai Sahar has been recently recognized with the laurel of the Most Promising Leader of the Year – Western Region at the second edition of the International Housekeepers’ Summit, 2017. The 2nd edition of International Housekeeper’s Summit was organized by I – Professional Housekeeper’s Association, India and Clean India Journal with the Asian Housekeepers’ Association consisting of 11 countries. The first of its kind in India, the IHS 2017 witnessed the convergence of Executive Housekeepers from different countries to deliberate, discuss and debate on carefully chosen topics to streamline the process of moving up Housekeeping in the corporate ladder. The two-day interactive session opened up avenues for networking, knowledge sharing, exchange of best practices and business development. JW Marriott Mumbai Sahar offers effortless elegance and sophistication. Located 1 km away from the Chhatrapati Shivaji International Airport Mumbai; making it an ideal destination for business and stay. With 585 intimate rooms, the property offers authentic cuisines crafted with passion, care and local flavors. With over 56,000 sq.ft. of indoor and outdoor convention space, the property offers 11 well-appointed meeting rooms with state-of-the-art conferencing facilities. The holistic Spa by JW offers a host of therapies to help you relax. At crafted perfectly so you are always left with the experience and luxury you truly desire. Visit us online on www.jwmumbai.com. Follow us on Facebook.com/JWSahar, Twitter @JWSahar, Instagram @JWSahar, Snapchat @JWSahar and Google Plus.